Hubel & Wiesel showed that the ocular dominance columns they had discovered in cortex (see previous post) are organized during a critical period of development. Keeping one eye of an animal shut during the first few months of life made that animal blind in that eye for the rest of its life. Keeping the eye shut for the same amount of time later in life had no such effect. Hubel & Wiesel found that the ocular dominance columns became lopsided in such a case: The functional eye tended to take over cortical space not used by the blind eye. 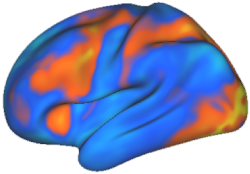 This finding extended Penfield‘s notion that the amount of cortical space dedicated to a function determines its resolution. In this case, visual acuity was decreased through smaller cortical space for the unused eye. Importantly, this experiment illustrated that the eyes compete for cortical space, with the most active eye claiming the most space. Generalizing this finding, it appears that many representations in cortex compete for space, whether it is in visual, motor, or somatosensory cortex. V. S. Ramachandran applied these findings in an interesting case involving phantom limb pain. He found that many patients who still felt pain in their amputated hand also reported feeling a touch on that phantom hand when their face was touched. As can be seen in the second figure of the previous post on the sensory-motor homunculus, the hand and face representations are next to each other in cortex. Ramachandran interpreted this to mean that the loss of input from the hand allows the face representation to win its competition with the hand representation, allowing it take over the cortical space previously dedicated to the hand. This also suggests that this competition continues into adulthood in some cases. Implication: The mind, largely governed by reward-seeking behavior, is implemented in an electro-chemical organ with distributed and modular function consisting of excitatory and inhibitory neurons communicating via ion-induced action potentials over convergent and divergent synaptic connections strengthened by correlated activity. The cortex, a part of that organ composed of functional column units whose spatial dedication (determined via local competition) determines representational resolution, is composed of many specialized regions involved in perception (e.g., touch: parietal lobe, vision: occipital lobe), action (e.g., frontal lobe), and memory (e.g., temporal lobe), which depend on inter-regional communication for functional integration.